Fast on the gun, pard. You posted about twenty minutes after I put the sucker up. We must be keeping the same hours. Nice soul patch, but Louis needs a Ron Burgundy 'stache. That one got me. Funny twist. Again, didn't see that one coming. Neat. Frazetta's art is amazingly timeless. He represents the best of sci-fi art, IMHO. 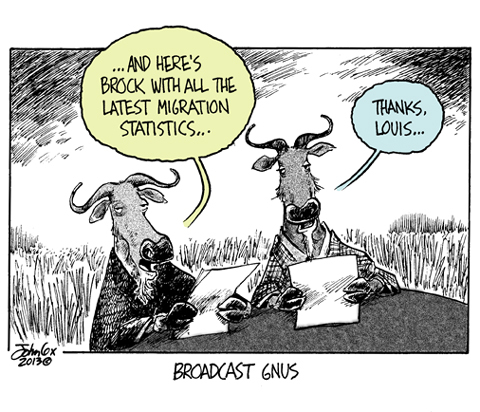 No gnus is good news. The King sentenced his court jester to death by hanging because of his awful puns. However, just before the hanging, the King pardoned the jester. The jester immediately exclaimed "No noose is good news!" The King hanged him anyway. Lord help me, creating visuals for puns is addicting. A story about a kingdom that outlaws puns is not a horrible idea for a whacky farce. This page contains a single entry from the blog posted on March 26, 2013 12:03 AM. The previous post in this blog was Budget Battle. The next post in this blog is Designer Fish.